If you subscribe to the Pragmatic Institute thinking that focus groups are qualitative - useful for collecting ideas – and that surveys are quantitative - best used to confirm assumptions - then news and social media monitoring is an emerging source of customer intelligence. It is analyzed aggregation of collective feedback that provides a new window into the thinking of the market. We’d readily admit that any sample of the media world, social or otherwise, no matter how large, is self-selecting. To that end, we are not arguing that product managers or marketers should jettison traditional research methods, but rather find ways to incorporate these volumes of new data sources into their market research. Verizon Wireless launched its own version of the iPhone on February 10th, 2011. So far, initial reports show that first-week sales have been weaker than AT&T’s launch of the iPhone 4, according to the Boy Genius Report. Surely there are several contributing factors, most obvious that until now, AT&T had no competition in the iPhone market. However, the point of this article isn’t to analyze the market factors, it is to demonstrate how media monitoring can be used to analyze thousands, if not hundreds of thousands, of data points that provide product marketers with feedback for planning and improving both products and launches. We say media monitoring, as opposed to social media monitoring, because when considered comprehensively, the two work hand- in-hand. For example, sometimes the chatter on social media reaches a threshold that prompts the mainstream media to cover a topic they might otherwise have ignored. In other cases, mainstream media drives the conversation on social media, as ReadWriteWeb reported. The search terms were elegantly simple: we monitored for references to the Verizon iPhone. The terms are unique enough to distinguish meaningful conversations from the noise. 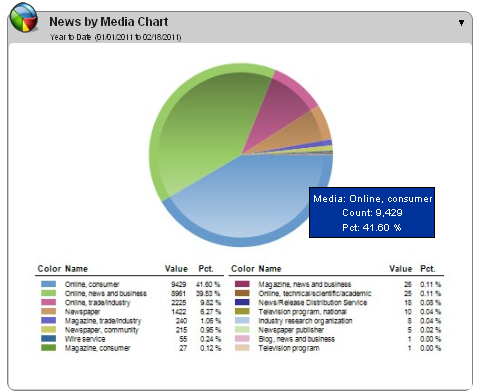 We next segmented our search by three categories: news, blogs and social media. Segmenting the searches in this way enabled us to see the relationships or interdependencies among them. News. News searches included monitoring coverage in virtually every U.S.-based top-tier national news outlet and major regional outlets, in business, consumer and technology publications and numbered in excess of 22,000 articles. Examples range from Vanity Fair to Bloomberg’s BusinessWeek and also regional newspapers like the Arizona Republic and Atlanta Journal-Constitution, which also captures stories produced by wire services like The Associated Press. Blogs. Blog searches were limited to the top 2,500 blogs according to a combination of data from Moreover and Techorati and based on a formula of traffic and comments. Examples include Lifehacker, Gizmodo, and The Huffington Post. In total, more than 14,000 blog posts were included in the analysis. Social media. Social media searches include every major social media site from microblogs like Twitter and FriendFeed, to networks like Facebook, to video and photo sharing sites including YouTube and Flickr. Social bookmarking sites such as Digg and Delicious were also captured. It’s important to point out we also include forums, which are still a thriving community and a bevy of information especially around technical subjects. More than 230,000 references in social media were analyzed. Verizon Wireless took a page from Apple’s marketing playbook by announcing its intent to sell an iPhone on January 11, 2011. While rumors had already circulated for some time, this was the official announcement confirming the plans. It mirrors the approach Apple follows with its product launches, for example the iPad was pre-announced before it was available in stores. The initial announcement caused a dramatic spike in coverage that was universal across news blogs and social media. The time that elapsed between the pre-announcement and the announcement of availability in stores – that is launch date – provided ample opportunity to evaluate market chatter and sentiment about the Verizon iPhone. It was a chance to identify potential issues, points that require clarification, and messages that resonate and should be reinforced at launch. It also helps us understand which mediums contain a customer center of gravity for Verizon’s iPhone. Are people talking about our product? Where are they talking about our product? Who are the key influencers shaping the discussion? The screenshot of social media coverage above answers this question with a sizable volume of chatter. 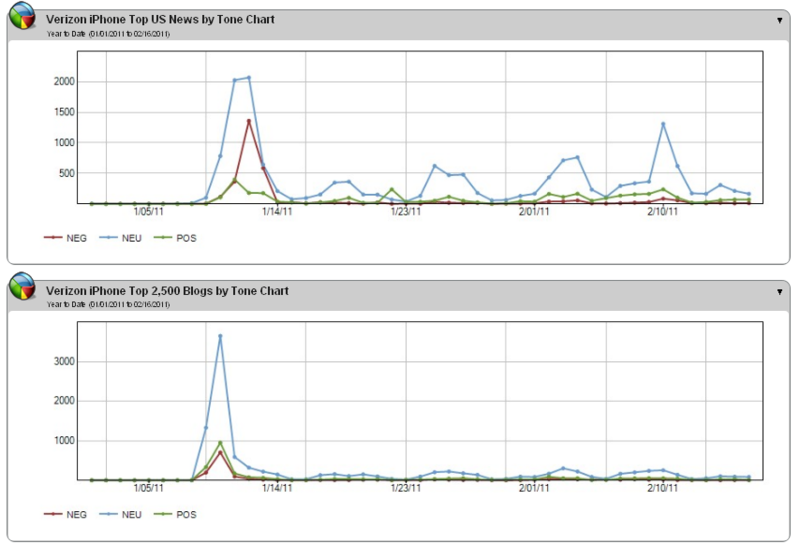 Notice how sentiment analysis trend lines flow over time, especially as compared to a similar view of news and blogs in the screenshots below. This is especially useful in comparing the segments by medium to identify and understand the correlation, or lack thereof, of chatter among news blogs and social media. For example, news coverage below shows a closer relationship between news and social media than between blogs coverage and news or social media. 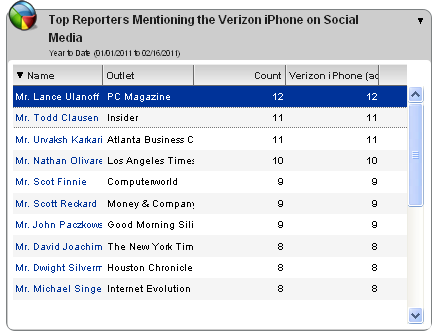 This tells us that in the case of Verizon iPhone, news drove the discussion on social media – as opposed to social media chatter driving news, which might be the case in a grassroots-driven launch. If we can understand where people are talking about our product, then we have a place to focus our efforts. It’s not surprising that more than 90% of chatter occurs on Twitter. Since the platform is open and easy to use, people freely share their (often visceral) reactions. With some 200 million users posting some 95 million tweets a day, it has a sizable user base and represents perhaps the largest focus group in the world. Forums rank as the next largest category for an important point because it’s often overlooked as part of the social media family. In the case of technology, forums are still widely used and fantastic sources of information to get feedback from dedicated technologists, gadget enthusiasts and especially savvy users. Since discussions on social media are driven by mainstream media outlets, it’s important when auditing for the purposes of planning where a particular product is most likely to gain traction in that medium. Given the iPhone’s consumer appeal, it’s not a surprise that consumer-oriented media gravitated towards the story about the product’s launch – roughly 80% of the 22,000 news articles were consumer-oriented. This is perhaps the most important question of all – if words are an indication of the market’s reaction. Analyzing what people are saying can come in two main forms: 1) sentiment analysis and 2) word cloud analysis. Sentiment analysis. 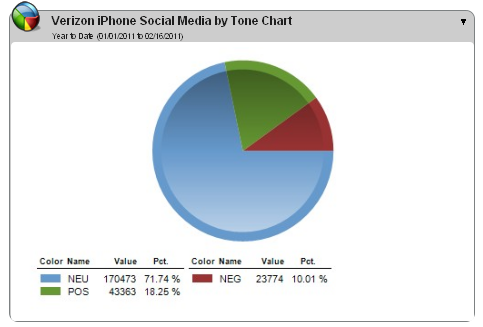 Sentiment analysis like the chart below provides us with the ability to segment by tone. Natural language processing (NLP) analyzes the words used in descriptions and determines the tone of the coverage as positive, neutral or negative. Once NLP is complete, we can drill-down into the individual segments to see what’s driving the trend. For example, looking at the negative (red) segment, we see the impact of this Tweet from @FastCompany, which shared an article that explored the challenges on Verizon’s path to commercialize the iPhone. It also raises business questions, such as whether or not Verizon seeks to launch an iPhone as a result of weak Android sales – or the competitive pressures between Verizon and AT&T over sales of iPhones. Likewise, if we drilled down on the positive (green) area, we’d be able to review what is resonating with iPhone audiences on social media. This might lead to points that should be reinforced during the launch. Word cloud analysis. Word cloud analysis sifts through a set of data and displays words in a “cloud” where the larger a given word is depicted is indicative of how frequently it was used in the content. Word cloud analysis enables us to understand the concerns the market might have and, more importantly, the language they use to describe it. When we first performed a word cloud analysis in a short post called What 90,000 Tweets say about the Verizon iPhone, one large phrase stood out to us - “make good.” The reference was circulated on a grand scale in social media that could be traced to a Gizmodo post about Verizon’s plans to make good – a monetary incentive program that Verizon Wireless was introducing to woo prospective customers that had purchased a new smart phone with a competitor recently, but were willing to switch to a Verizon iPhone. The popularity of this program suggests it’s a great message to reinforce at launch time. 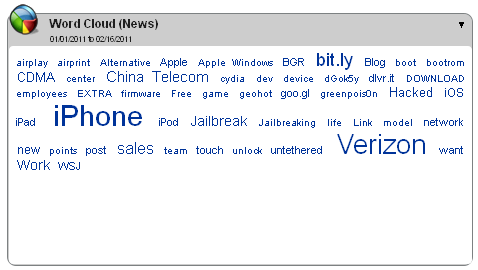 The screen shot of a word cloud analysis below analyzes more than 230,000 references to the Verizon iPhone in social media. 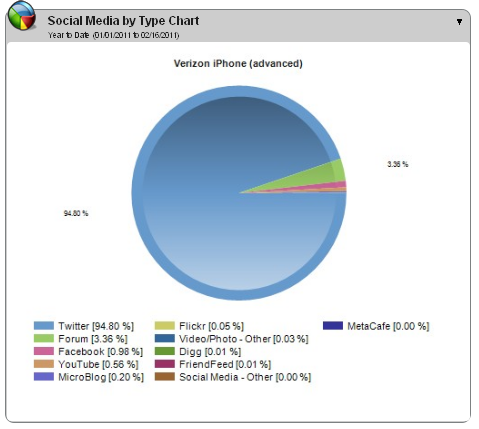 Words like “jailbreak,” “untethered” and “China Telecom” all point back to underlying data suggesting the conversation is related to set up and usage of the Verizon iPhone in ways other than it was intended. For example there are hundreds of tweets referencing a Wall Street Journal blog post about Chinese Telecom employees hacking the Verizon iPhone. It’s certainly a subject any iPhone product manager would see as an important problem to tackle. Influence is relative and followers alone should not be the only determining factor. 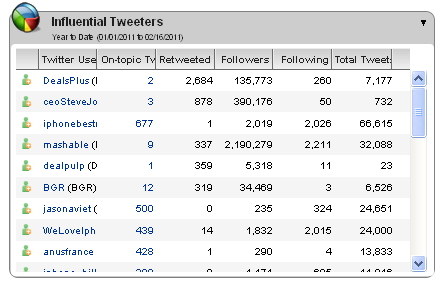 Relevancy, propensity to be retweeted, and on-topic posts are all factors an algorithm uses to identify the most influential Twitter accounts in the screenshot below. For example, the monitoring system identified @BGR’s tweet which stated the user would not switch from AT&T to Verizon because of the data connection speed. The Twitter handle, which has 30,000 followers, belongs to the “Boy Genius” an influential, albeit, anonymous blogger, and was retweeted 60 times. Media monitoring also noted tweets by potential spoof accounts including @ceoSteveJobs, which has amassed 400,000+ followers (and is surely on Apple’s radar) and @verizoneiphone, which tweeted 500 times about this announcement, including many on January 12 2011, but has earned just two followers. The brand affiliation (despite the misspelling), the potential harm that the handle could cause should it catch momentum, and volume of tweets makes it a Twitter account worth monitoring. Separately the system also identified reporters that discussed the Verizon iPhone on Twitter. These include The New York Times banking editor David Joachim, who lamented he’s a relatively new AT&T customer and had the Verizon iPhone been launched earlier he might have waited. He also tweeted a link to a New York Post article which says Verizon Wireless “may have to eat as much as $5 billion in subsidies over the next 12 months to win over customers” which as a banking editor understandably caught his attention. If we can understand who is talking about us, especially the key influencers, we can be more intelligent about future engagements. Should I switch to Verizon Wireless if I just signed an AT&T contract? Will Verizon have a similar data pricing plan as AT&T? Will the Verizon iPhone have more or less dropped calls? Does a 4G network make it worth switching to Verizon’s iPhone? Media monitoring provides a wealth of data that can be used for research purposes leading up to a product launch. Monitoring is truly “listening” to – in a volume that has traditionally been unattainable – the concerns, gripes or kudos the market has to say about a given product so that companies might address those concerns in the language of their customers and prospects. The world is your focus group.